Neonatal Critical Care Nurse, Sue Salvemini has worked at Flinders since 1988! 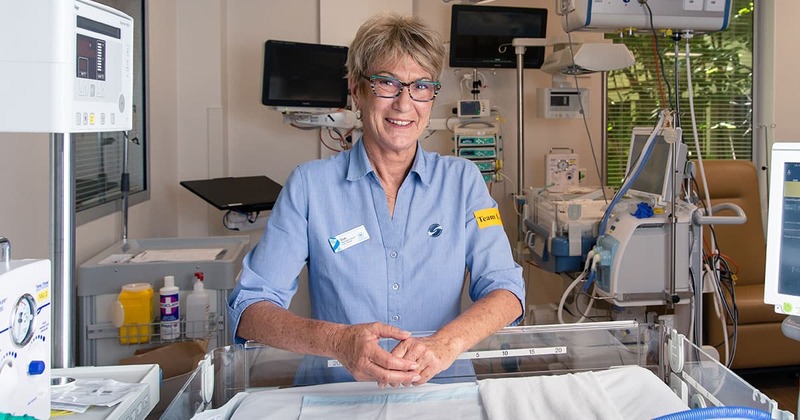 For our Autumn 2019 Your Foundation Newsletter we had a chat with Flinders Medical Centre Neonatal Critical Care Nurse, Sue Salvemini, who has been working at Flinders since 1988! How long have you worked in the neonatal unit for? This has been my second home since 1988 – so 31 years! I spent a couple of years of that working as a neonatal nurse in Saudi Arabia which was very interesting. Tell us about the Neonatal Unit? We look after about 1300 premmature babies or sick newborns each year and along with that also provide support for their parents. We care for these babies 24/7 and are also ‘back-up cuddlers’ for when their parents can’t be here! I love my babies! There’s something so rewarding about seeing such a traumatic start in life and the journey over the next few weeks or months with lots of ups and downs, and then seeing them leave here in their pram. What’s your advice for parents of babies in the Neonatal Unit? Take every day as it comes. It’s not an easy ride and unfortunately, we can’t hurry time along. But in the meantime, we’ll tell you everything you need to know and take the best care of your baby. Do you have a favourite moment from your time in the unit? I think it’s having families stop me when I’m out and about because they recognise me, and they show me their babies all grown up. For them it’s often still so raw, but it’s so lovely for me to see them come out the other side.